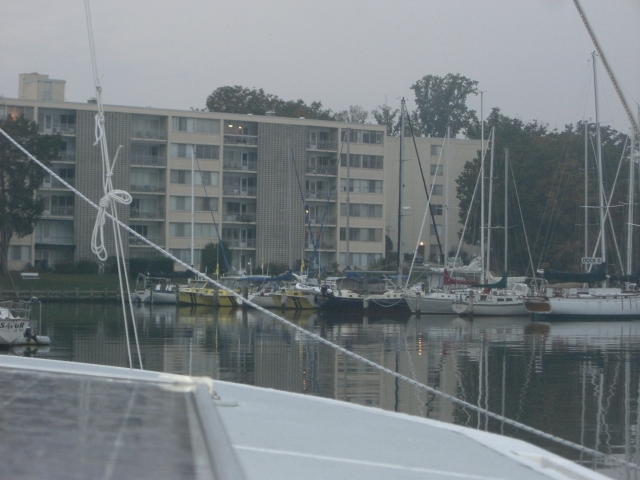 After 3 years running of driving down to the boat show on Columbus Day weekend, we arrive in Annapolis via s/v Ortolan. Yes, the trip was much longer, but much more enjoyable. Monday was sunny and we treated ourselves to outside dining at Middleton’s for lunch; a great spot to people-watch. We anchored in Back Creek, not the kind of creek you might expect- loaded with marinas and oodles of sailboats. However, it had something the general anchorage did not- a spot right in front of Kerry’s Mom and step-dad’s apartment (Faith & Danny). Upon our return from a 4mile RT walk to Giant (equals Stop&Shop) and Fawcett’s (better than West Marine) we joined Faith and Danny for dinner.